An interesting technique for you to achieve the Curly Ribbon look - combines crafting and Baking :-D Brought to you by Wendy Stamps last year. These curlys can be used in a variety of centerpieces, on favors and gifts (hairbows as well as wrapping bows, I am picturing it now! ), and would make for some great Home decor pieces as well! Wooden Dowels - the thickness of the dowels will determine the size of the curl - ones used were 1/4" in diameter. Try experiemnting with different sizes. 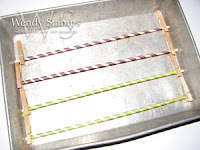 For the ribbons on the cake centerpiece (see link in name, above), two dowels put together to make more of a zig-zag curl. You may even try using popsicle sticks - anything wooden and oven-safe. 1. Use a clothespin to secure one end of the grossgrain ribbon to one end of a dowel. 2. Wrap ribbon around the dowel, being sure to leave space between each rotation as shown above. If you do not leave space, the finished piece will resemble a long tube of ribbon instead of a springy curl. 3. When you get to the end of the dowel, cut the ribbon and secure with another clothespin. 4. Place your wrapped dowels on a cookie sheet or baking pan. The clothespins keep the dowels and ribbon from touching the bottom of the pan. 5. Bake ribbons in oven at 275 degrees for 30 minutes. Remove ribbons from oven and allow them to cool completely before removing from dowels. 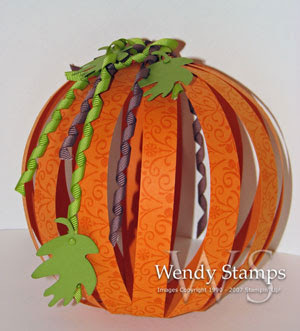 The 3-D pumpkin was adapted from one found on the Stampin' Up! demonstrator website, & the Big Shot was used to cut leaves from old olive cardstock using the Leaves #2 Die. She wheeled a design onto 3/4" X 11" strips of Pumpkin Pie cardstock. Everything is held together with rhinestone circle brads. The curly grossgrain ribbons made festive vines and tendrils!